It actually does look like Spring might be arriving soon here in the North Carolina mountains. It will be 72 today, then 23 tomorrow night with a chance of snow??!! Go figure. In the meantime, I have been warming things up in the living room with hot pink and the gold/brass that I showed in yesterday's post. I really don't have anything blooming outside yet, and I haven't forced any flowering branches, so I am using fabric for that pop of Spring color. I really love this shade of pink because it's bold and has a modern look that offsets all the antique furniture and vintage accessories. 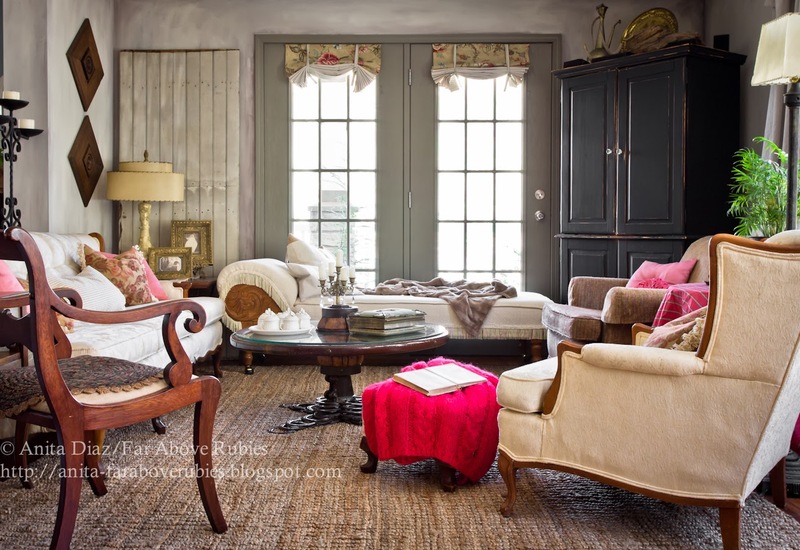 A 1960s hot pink sweater is draped across the back of the chaise lounge to break up the white. I found so many great remnants at the "fire sale" my local fabric store had, that I have no problem finding different textures and shades of pink that all work together. I made the square pillow, and my grandmother made the round one years ago. 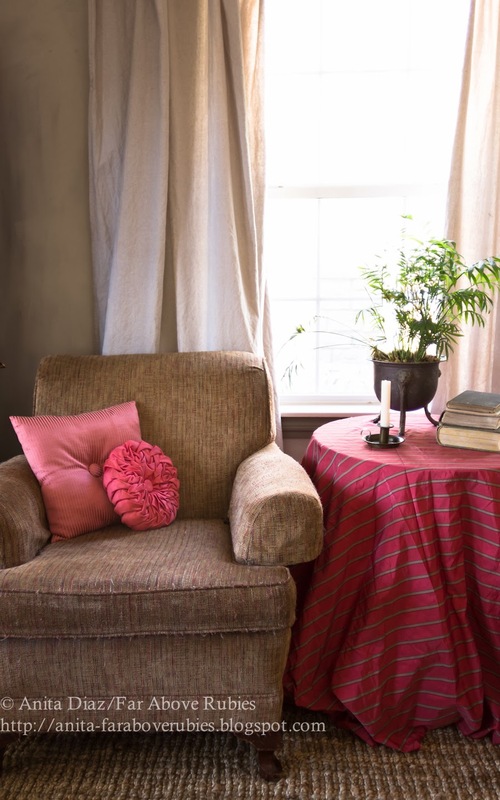 The dark antique table got a needed softening and pop of color from the pink and grey striped taffeta. Oh...I never showed you my new (old) lampshade, but this vintage fiberglass shade was an ebay win. I love Eames-atomic-era shades so much, and they can really update a fussy old lamp. 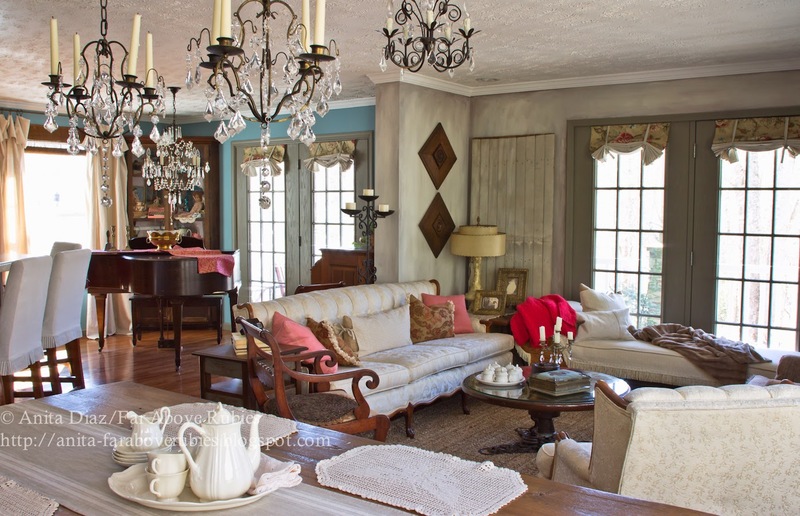 So until it warms up outside, the hot pink will have to brighten these early Spring days inside. Beautiful pops of hot pink Anita. Spring has sprung in the Diaz' home. Great spring touches. I love hot pink and wear the color all the time. Loving the pops of pink, Anita. 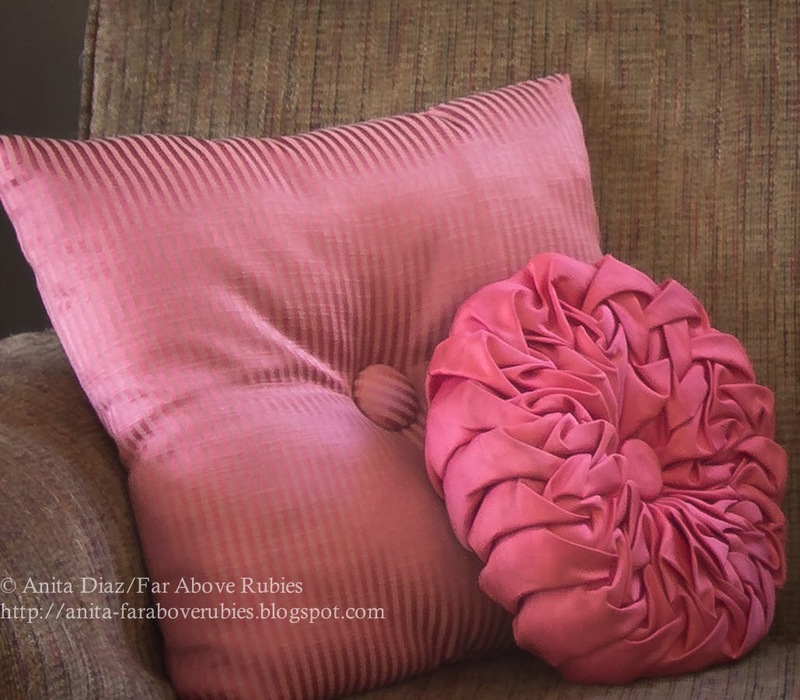 Your pink accents looks so bright and pretty in your living room. My favorite color for pyrex!! I am on the hunt now. I would love for you to share on my Chic By You Link Party @ http://chicbytab.blogspot.ca/2014/03/chic-by-you-wednesday-link-party-3.html. Hope to see you there! Beautiful!! I love the splashes of pink. And I love how Angela gave you such a lovely gift! So happy for you Anita!! 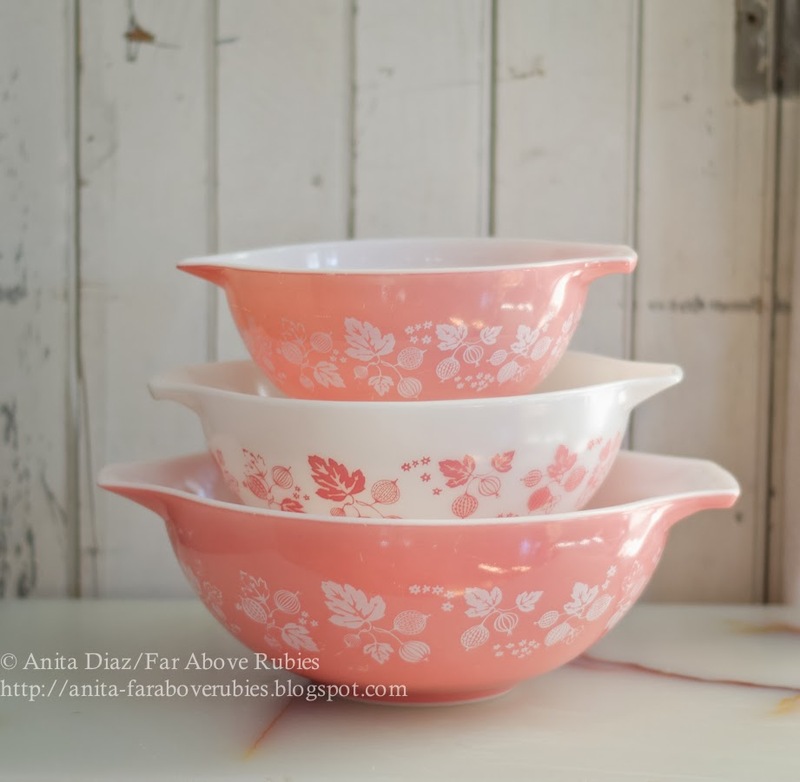 Those pops of pink look so great Anita and perfect for Spring! And what a thoughtful gift from your reader! Love the bowls... how kind of your reader!!!!! The pinks are gorgeous touches of "Spring" !!!!! Pretty touches of spring, Anita! I love it! But then I'm always one who loves pops of color. Seriously...if you ever let me past your front door, don't expect me to leave anytime soon thereafter! I could just luxuriate in this beautiful, comfortable, welcoming space for DAYS!!! Yes...I said DAYS!!!!!!!! There is just such an easy elegance about it. So pretty, but not "hands off" at all. Fabulous, Anita! Your living room-dining room is gorgeous and all your hot pink touches are just perfect for spring and they stick out with great pizzazz! I love it! Lovely, Anita! 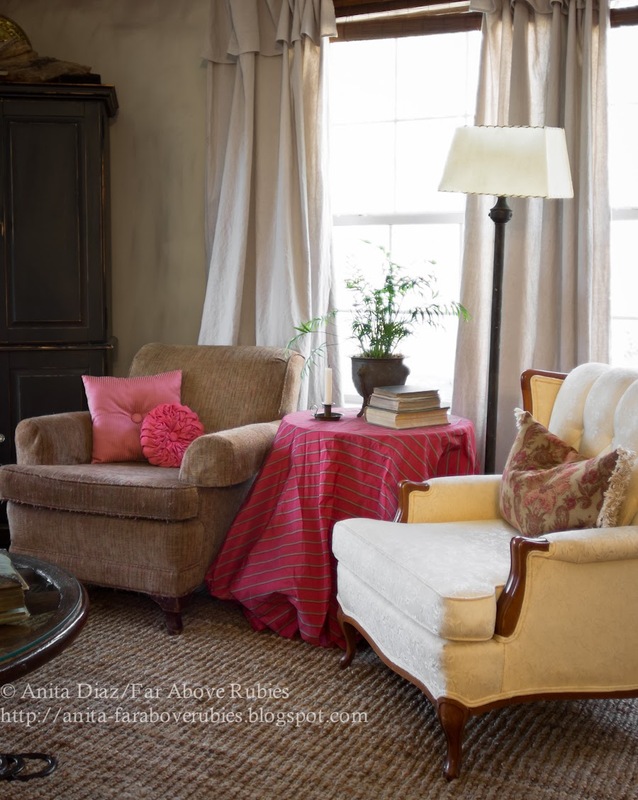 Hot pink is perfect in your living room, very welcoming! I love hearing you sing! Such a great living room, very jealous. Please share your beautiful taste at the Bacon Time linky party. Last weeks party is still up, but the new one starts tomorrow. 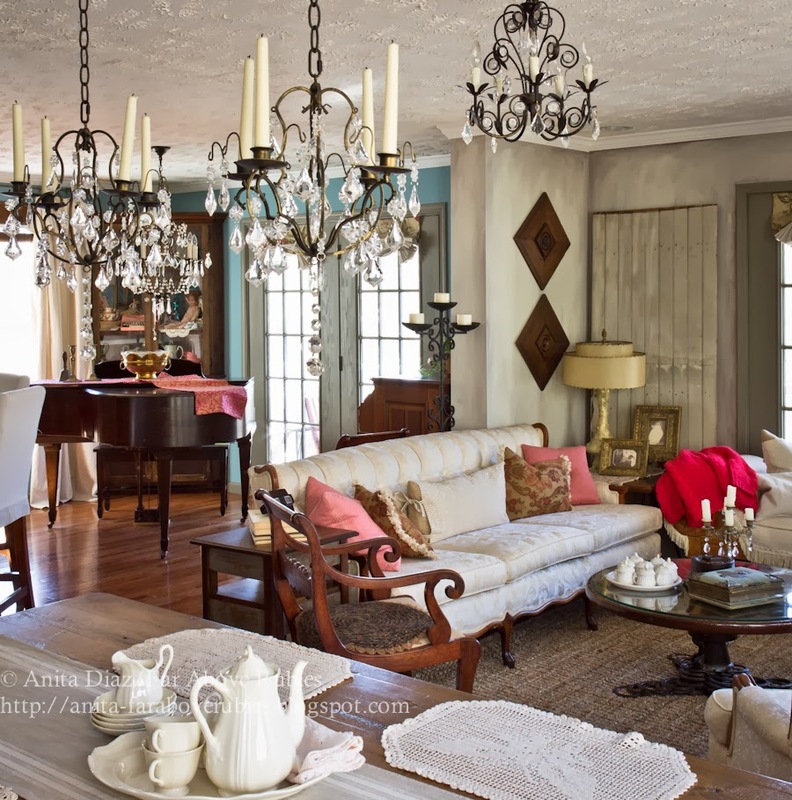 You have such a fabulous knack for pulling together your beautiful collected pieces into spectacular design! 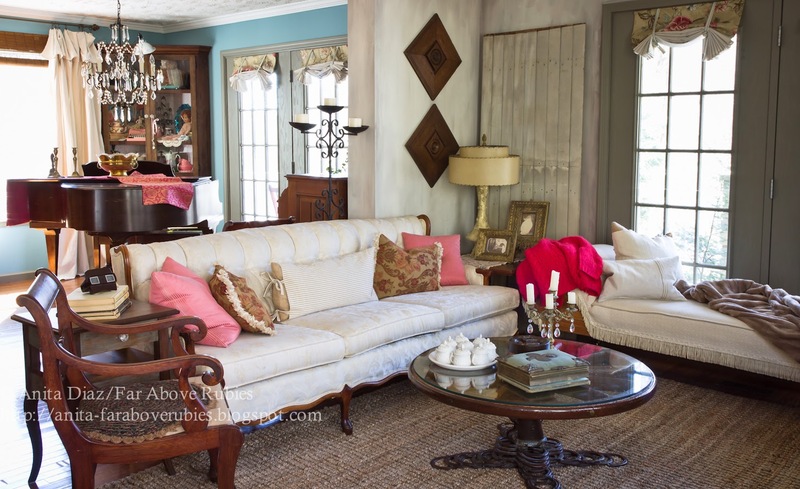 totally LOVE this, that pink is amazing, especially with that great blue in the next room!